Members of the audience asked about immigration, gun control and congressional rules, among other topics. 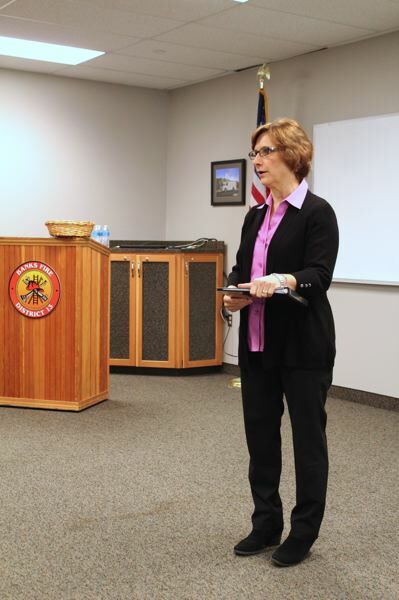 At a town hall meeting in Banks on Saturday, Sept. 22, U.S. Rep. Suzanne Bonamici outlined her positions on a number of issues and expressed her frustration with both congressional leadership and the Trump administration. "I'm terribly sorry about what happened to you," Bonamici responded, before going on to outline why she opposes Measure 105, citing a statement by Washington County Sheriff Pat Garrett and District Attorney Kevin Barton, which was published last month in the News-Times, stating the measure would negatively affect public safety. "The law that is what's called a sanctuary law is not to protect people who have committed crimes. That's not what it's about," Bonamici said. "If there's somebody who was a witness to a crime, no matter who committed it, we want to make sure that that person comes forward. If somebody gets away with a crime because the witness to that crime or the victim of that crime is undocumented, then that's somebody getting away with a crime, and that's unacceptable. … Of course we want to make sure that the people coming to this country are not people who committed crimes like what happened to you, and again, I'm very sorry for what happened to you. I can't imagine anyone having to go through that. It's wrong. It's wrong no matter who did it." Bonamici said she favors "comprehensive" immigration reform, as well as protections for so-called "Dreamers" brought to the United States illegally as children and who have grown up in American society without having, or being eligible for, a legal immigration status. But efforts to pass those bills and others have been thwarted by hostile committee chairmen and other leaders in the Republican-controlled Congress, she said. Several members of the audience wore red Moms Demand Action T-shirts to the town hall meeting, representing a national advocacy group calling for stronger gun control legislation. Bonamici posed for a photo with them after the meeting, and during the meeting, she answered a question from one woman who asked if there is any hope for bipartisan legislation on the issue. Again, Bonamici said opposition from congressional leadership has prevented Congress from considering legislative proposals she believes have widespread support among the rank-and-file, such as instituting universal background checks on all gun purchases. "My prediction is if we could vote on it, it would pass," Bonamici said, adding, "We should be able to vote on these issues, and hopefully we will, at some point." Perhaps the biggest audience response during the town hall meeting came when a questioner asked Bonamici what can be done about changing congressional rules that "are getting in the way of democracy," such as those allowing committee chairmen to decide unilaterally not to bring a bill up for a vote. To applause, she asked, "What are the chances of fixing the system so that our representatives can represent us?" Bonamici replied that she has been a legislator when House Democrats were in the majority, from 2012 to 2015, as well as with Democrats in the minority since then. She said she hopes that those rules can be loosened, but in the meantime, she is focused on building relationships with other members of Congress to have an influence where she can, even though Republicans control both chambers of Congress. "I'm a Democrat, but I've worked with some of the most conservative Republicans in Congress," said Bonamici, who serves on both the Education and the Workforce Committee and the Science, Space and Technology Committee in the House, as vice ranking member and ranking member respectively. Despite that, Bonamici criticized Republican President Donald Trump for his rhetoric on both immigration and trade, a topic she noted is particularly important in the region. "We live in a very trade-dependent region here in the Pacific Northwest. We make and grow a lot of products that people want around the world. But this sort of trade policy-by-Twitter is really hurting our businesses," said Bonamici, referring to Tweets by Trump that have threatened "trade wars" with major importers of U.S. products like China. Bonamici described hearing from a range of businesses in the First Congressional District, including hazelnut growers and technology companies, that retaliatory tariffs are taking a disproportionate toll on them. 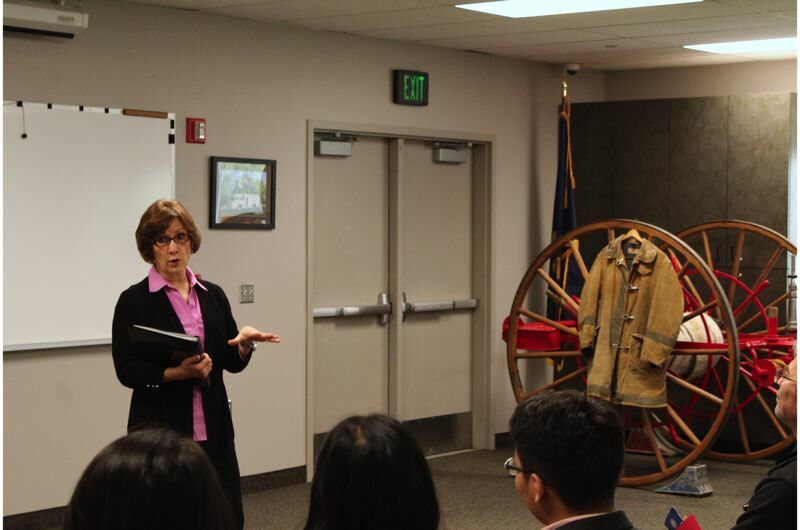 Bonamici's town hall meeting in Banks was her first of two scheduled for Saturday. After the event, she headed northeast to Scappoose for a town hall meeting there. Bonamici is up for re-election on Nov. 6, although she told the News-Times after the Banks meeting that the town hall was not a campaign-related event and she did not mention her re-election efforts throughout the meeting. She is favored against Republican John Verbeek, a perennial candidate who has not reported any campaign spending with the Federal Election Commission. The nonpartisan Cook Political Report rates the race as "Solid Democratic."